A Lancaster of No. 61 Squadron, RAF, piloted by Flt. 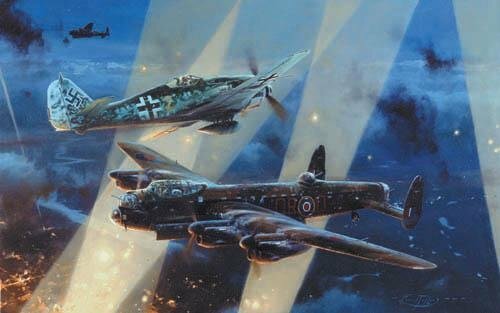 Lt. Bill Reid, under attack from a German Fw190 en route to Dusseldorf on the night of November 3rd, 1943. Already injured in a previous attack, Bill Reid was again wounded but pressed on for another 50 minutes to bomb the target, then fly his badly damaged aircraft on the long journey home. The courage and devotion to duty that earned Bill Reid the Victoria Cross, was a hallmark of RAF bomber crews throughout their long six year campaign.